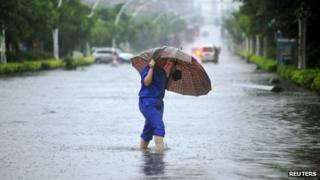 Three people have died after Typhoon Soulik hit China's southern Guangdong province, state media say. The storm, which has already killed two others in Taiwan, forced a further 20,000 people to flee their homes, the Xinhua news agency reports. Some 300,000 people have already been evacuated from eastern China amid warnings of floods and landslides. Forecasters say the typhoon weakened as it moved inland on Sunday but heavy rain and strong winds persist. Winds of 119 km/hour (74 mph) had earlier lashed the coastal Fujian Province, said China's National Meteorological Centre. Emergency response plans were being implemented, said Xinhua, after recent torrential rain reportedly left 200 people dead or missing. Thousands of soldiers were deployed to carry out relief work. Typhoon Soulik, the seventh typhoon to hit the Chinese mainland this year, first hit Fujian province on Saturday afternoon. It moved to Jiangxi province early on Sunday and torrential rains toppled more than 1,000 houses in Guangdong, Xinhua said. Soulik was downgraded to a tropical storm on Saturday night, the China Meteorological Administration said. The typhoon earlier led to extensive flooding in Taiwan. Two people are reported to have died on the island, while more than 8,500 people were evacuated from mountainous and other areas prone to landslides. A police officer was apparently killed by falling bricks in the capital Taipei. More than 100 others were injured. In Fujian and Zhejiang, another Chinese coastal province, flights and train services were cancelled and fishing boats called back to shore. Waves as high as 10m (32ft) hit Yuhuan County in Zhejiang province and authorities warned residents to stay away from the dangerous coastline. The strong winds and heavy rain have caused electricity disruptions, a run on food and essential supplies in supermarkets, and uprooted trees and signs in some areas. Typhoons are common during the summer in parts of East Asia, where the warm moist air and low pressure conditions enable tropical cyclones to form.